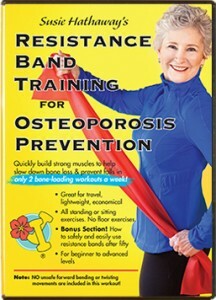 Resistance Band Training for Osteoporosis Prevention DVD Released! Thank you, everyone, for your patience and many requests for my “Resistance Band Training for Osteoporosis Prevention” workout on DVD. I’m happy to say that it’s completed and now available on Amazon.com. Click here to see details and a video clip! In my Strength Training for Osteoporosis Prevention classes I change things up with resistance bands. Add variation to your workouts; your muscles and bones will respond by getting stronger. With resistance bands, you’ll find muscles that have been hiding out, more than happy to let their neighboring muscles do all of the work! Remember, all of your skeletal muscles are attached to your bones. With each contraction, your muscles give your bones a little tug. The stronger they are, the harder the tug. University research repeatedly shows that stronger muscles, all pulling their weight, can halt bone loss in its tracks, in just 2 muscle strengthening workouts a week. Only 2-four foot resistance bands are all that you’ll need to get a fabulous workout. They’re lightweight, great for travel or home, and so economical. I designed the workout so that you won’t have to wrap the bands around anything or buy hooks for your door. I’ve done this workout in an airport AND many of the moves on an airplane! It’s convenient and easy with all standing or sitting exercises; no floor exercises. See my “5 Tips for Choosing the Right Resistance Bands” blog post for shopping tips! Check it out! Resistance Band Training for Osteoporosis Prevention on DVD and Amazon Instant Video download!